Hello Everyone! It's Lindsay, from the DT, here with you today and I am obsessed with the new February mood board for the #cddmonthly Social Media Challenge! 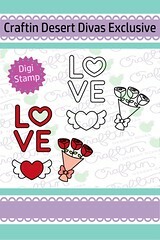 It is perfect for any Valentine's Day card you may need to make, or as I'm doing today, an Anniversary or Wedding card! And so many cute new digis have been added to the Craftin' Desert Divas Shop that fit this board perfectly!! 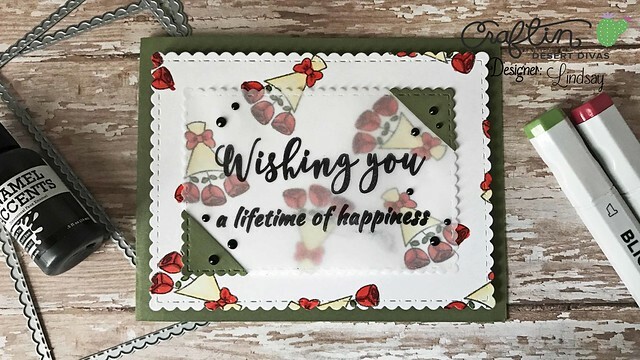 This card was definitely a labor of love and changed directions so many times, but in the end I knew I wanted to add a vellum sentiment panel in the center of this card. Vellum can be a bit tricky to adhere so not only do I want to share the changes that this card went through from start to finish, but also some tips and tricks for adhering vellum! You can watch the video tutorial below for all the details! Starting in Photoshop Elements with a new blank 6 x 6 project I brought in the flowers digital stamp from the "Wings of Love" Digital Stamp Set and just kept duplicating and moving the stamp around to create my own patterned paper. After printing it off with my laser printer, I used my alcohol markers to quickly color in the images. Finally, with the largest scalloped rectangle die from the "Fancy Frame" die set, I cut the 6 x 6 paper. 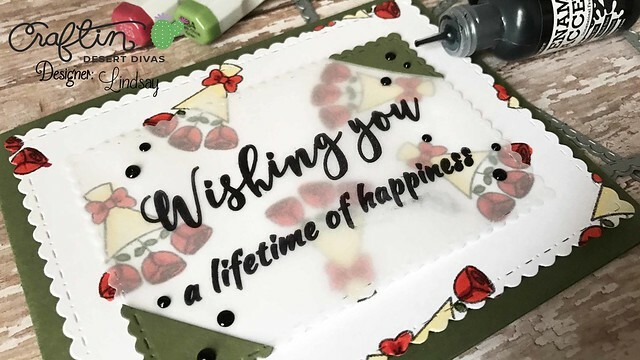 For the sentiment I used the "Wishful Thoughts" stamp set and built up a "Wishing You a Lifetime of Happiness" sentiment to stamp onto a vellum scalloped rectangle die cut, from the same die set as before. I used my MISTI and black die to ink to stamp it. To secure the vellum die cut onto the larger patterned paper die cut I used the smaller die to cut two corners from green card stock (the same shade I was using for the card base). After cutting the corners to the exact same size, I adhered them onto the front of the vellum die cut, on opposite sides, with double sided adhesive. 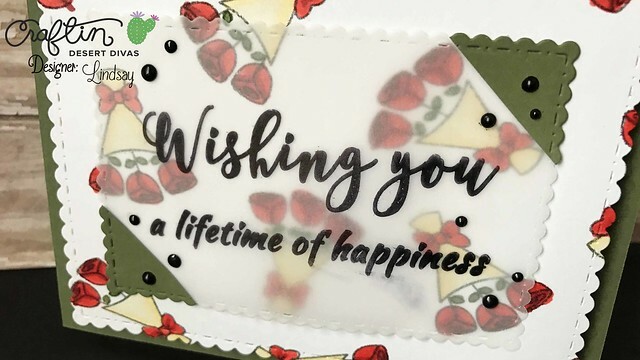 To finish this card I first adhered the patterned paper die cut onto a green A2 top folding card base with fun foam and double sided adhesive. Then, using the same double sided adhesive, I adhered the vellum die cut in the center of that panel, putting the adhesive behind the green corners I adhered. I also used a tiny bit of multi medium matte on the two corners without any adhesive. Finally, to pull everything together, I added a few drops of enamel accents in Black Tie, and scattered them around the sentiment! Don't forget to make a card of your own and enter it into the Social Media Challenge! So many new digis were recently added to the shop, and they fit this month's mood board perfectly!!! Plus, they're only 99 cents so be sure to hop over to the shop and check them out! Thanks for stopping by today!! You can find the CDD products I used on my card linked up below!! Happy Crafting!! This card is so pretty - love the vellum overlay!